A sixth generation Texas Family welcomes you to savor world class wines overlooking breathtaking views of the Texas Hill Country. 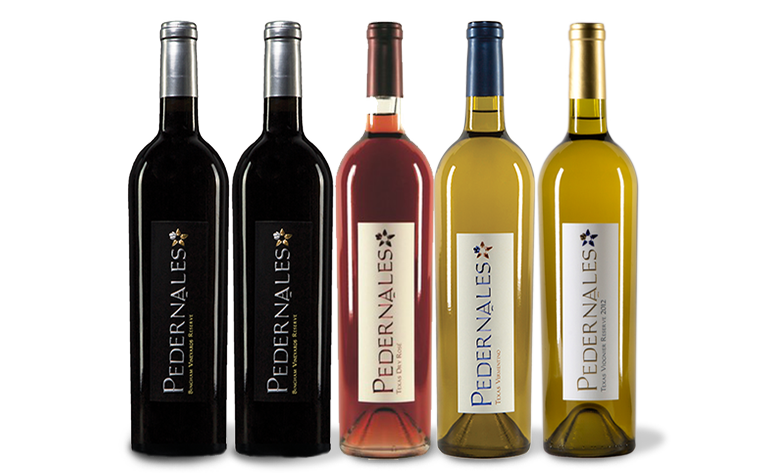 Pedernales Cellars specializes in Spanish and Rhone style wines, including benchmark Tempranillo and Viognier. Join us in celebrating wine! Throughout the year we host various events, dinners and live music. This is our select blend of High Plains and Hill Country Tempranillos, reflecting the highest quality in the 2015 vintage from both our estate and partner vineyards. The cherry and mineral notes of this wine with its subtle tannins provide a perfect complement to Texas BBQ and southwest peppers. This vintage is a blend of Malbec, Mourvèdre, Tempranillo, and Cabernet Sauvignon from select lots within Newsom Vineyards. The result is a rich, well-balanced red comprised of notes of black cherry, leather, earth, and tobacco. This wine would pair nicely with steak, lamb, or venison. The nose on this Italian blend of Dolcetto, Montepulciano, and Sangiovese is redolent of the old world, with notes of dried herbs, black liquorice, leather, dried cherries and bright fruit. Earth tones of wood and tobacco contribute to a complex finish and smooth mouthfeel. This full-bodied wine is fruity and bright on the nose with notes of candied watermelon, guava, red delicious apples, and strawberries. On the palate, notes of cherry and strawberry carry through with a crisp acidity. The 2016 Texas Viognier Reserve gives aromas of fresh citrus and honeysuckle with hints of guava, pineapple and ripe peach and toasted hazelnuts. You’ll find this full-bodied Viognier lush and smooth on the palate with sweet honeyed and pineapple notes. The 2016 Texas Vino Blanco, our first vintage since 2013, offers soft floral notes of blossom and honeysuckle along with mango, peach, and apricot flavors. On the palate it is smooth and lingers with a crisp finish of ripe citrus. The 2016 Albariño showcases notes of lemon, apple crisp, pear, ginger and even mango. On the palate, you’ll find the wine to be full-bodied with lemon and almond notes which are complimented by vanilla undertones. On the nose, you’ll find the 2016 Roussanne rich with aromas of lemon, white flowers, and brioche with hints of grass or fresh cut celery. On the palate, this wine is full-bodied with a crisp acidity. Notes of citrus, lemongrass and vanilla are followed by a subtle toast and a long finish. This white wine is crisp and acidic, with aromas of tropical fruit and white flowers. There are notes of green apple and citrus rounding out the palate. The light nature of Cinco makes it a natural pairing with soft cheese and appetizers like ceviche and sushi. The 2016 Newsom North Block is a Bordeaux style blend of 60% Cabernet Sauvignon, 25% Merlot and 15% Malbec sourced exclusively from Newsom Vineyards in the Texas High Plains. The 2016 GSM Mélange is a blend of Grenache, Syrah and Mourvedre along with Carignan and Tannat. Medium in body, this wine provides aromatics of dried currants and strawberries with more earthy bramble, flint, and peppery notes. Dried strawberries and cherries follow on the palate combined with dried green herbs and cedar. The 2016 Bingham Reserve is a beautiful and complex Tempranillo blend with a deep ruby color. The blend is predominantly Tempranillo at 90% with 7% Petit Verdot and 3% Mourvedre. The 2016 Kuhlken Vineyards Reserve is a rich and complex wine with aromas of crushed mint, cranberries, red cherries, thyme, sage, black pepper and smoke. On the palate you’ll taste juicy strawberries, blackberry, plum, dried herbs, tar, and bramble. Firm but refined tannins linger on a pleasantly long finish; this wine will get better with age. Our 2016 Family Reserve has complex aromas of cher-ries, raspberries, black pepper, cocoa, anise, as well as floral notes of violets and roses. On the palate you’ll find this medium bodied wine has fruity flavors of dried strawberries, cherries, raspberries, and black pepper, with hints of dried herbs and cocoa. Stonewall Glögg is available now. Get winter ready with this special holiday wine! Texas Ruby shows notes of apricot, clove, walnut, cedar, leather, and licorice with a full and almost spicy finish. Texas Dulce is a wonderful complement to rich and creamy desserts.